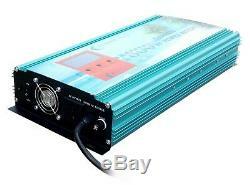 1800W Grid tie power inverter. DC 26.4V-45V to AC 110V. With 3.5 LCD meter. 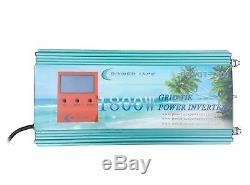 For solar panel 24V system (best solar panel working voltage 36V). AC Output watt :0 Watt (Max display power 15KWcan display running power less than 1W). AC Output Volt : 0 volt (Max display volt 270V). AC Output Amp : 0 Amp (Max display amp 55A). Total Operation time :0-60000 hoursOperation time: 059 minutes to 24 hours to 2500 days. Total operation time , electricity consumption and electricity cost can clear. Can set up power , the meter will alarm when reach reserve power. Can set up the cost. Refresh rate: one time 0.5 seconds. Whats new of this version? We separated the positions of the Red and Black DC input terminals. This provides for easier connection and makes an accidental short circuit much less likely. There are 2 ball type fans for greater air flow. The CPU lifetime is extended by 5 times the old version's. PCB board: last version used SMT parts. These are easily dislodged by impacts or thermal expansion. The new version has 2 groups of capacitors, total 12 pieces. The low impedance filter is more efficient, running 27. The old version used a current and voltage control IC that had instabilities. The new version uses a new microchip from the USA. It is very stable and the reaction speed is 10 times faster, 100 times more precise. Double protection circuit for AC when there is over voltage, an island reaction, or a voltage spike. This will protect the inverter quickly if there is instability in line power. For the old version, when switch off the inverter, vestigial current and voltage in the DC side could damage the AC mosfets. In the new version, when you turn off it, it will turn off both AC and DC sides and cut off the IC signal. This will prevent any damage to the mosfets. When input power is 600w, the efficiency can reach to 90%, so the fan does not need to run offend. The high efficiency keeps the insides cool and can utilize a greater percentage of your solar power. When input power reach 1200w , the efficiency will stay at or above 87.5%. The new version has only 1 bi-colored light: low voltage: the red light flashes and the inverter will not function. High voltage: the green light always on and the inverter will not function. Normal situation: The led light will be green color flashed; led light will flash fast when power is strong. PSWGT-1800-26.4-45-110 + LCD meter. DC 26.4-45 Volt (solar panel). Dimensions (L x W x H /cm). 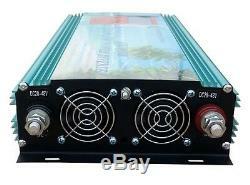 The inverter are designed for solar panels energy directly , no need battery! For battery, 24V battery for DC 14V-24V inverter; 36V for DC 26.4V-45V inverter, but please do NOT hook inverter with battery banks for a long time , it will burn the parts of inverter over a period of time. This inverter is not available for wind turbine system. Sometimes, if you are using some heaving appliance like motor, engine, cause the voltage up down very fast, in this moment, big amp will come into the grid inverter, easy to cause the ac mos burned, so surge protector will cut down by itself to protect the grid inverter. You may have experience, when meet the big lightning, the power source of the home appliance may damage, same reason, will also cause the inverter damage, in this moment the lightning protection can release thousand voltages to protect the inverter not damage. Now we put ac fuse outside, each inverter will come our special ac fuse, this will be broken 1 mini/sec, to make sure high voltage spike come in! Is designed for small solar panel & wind energy market, it's suitable for family energy system. This inverter can directly use solar panel, wind charger through inverter to home grid. Easy to installation, just need solar panel, grid tie inverter, then directly can put into home grid. The inverter can be connected to any outlet in the home providing line power. The inverter IC will monitors the voltage, frequency and phase of the home grid, then produce a pure sine wave phase locked to the grid. The voltage will be just enough higher than the grid's to feed power into the grid, Then using our current controlled PWM we control the output power to the grid. The inverter will put out power when the home grid is on. The inverter will stop feeding power into the grid when the grid is down, for safety and as required by law. Why should you use a grid tie inverter? When you use power from solar panels to supply the inverter, your home power. Meter will run more slowly(if you are using other electric appliances), or your. Home power meter will run backward(if you are not use any appliances). Why should you use a Power Jack grid tie inverter. In traditional grid tie inverters, the solar panels are connect in series so if one solar panel did not work or had poor efficiency or had a blown bypass diode, then the whole system is affected. With Power Jack inverters, you can use all panels in parallel so if one is not working properly, you only lose the output from that one panel. You can also run several Power Jack inverters parallel instead of having one large expensive unit. If you have just one expensive inverter and it fails you produce no power. If you have several smaller units and one fails you still produce power. Each inverter has it's own MPPT function so you can extract the maximum power from all of your solar panels. When the dc charge function is normal, the inverter supplies power. If there are no dc sources (like at night or a cloudy or rainy day), the inverter will stop attempting to supply power and shut itself off from the power grid to protect itself and lengthen its lifetime. For DC 26.4V-45V inverter. 11.5V - 13.5V. Orange light on, fan keep working, but inverter stop working. Green flash faster and more powerful output. Manufacture defects or workmanship, use appropriately, surface of item do not scratch. Manufacture defects or workmanship excludes damage caused by inappropriately used such as improper installation, accident, misuse, abuse, improper storage, or any unauthorized disassembly, repair, or modification. My solar panels are 210W 5 pcs, should I use 5 panels on one inverter or 4 panels. I live in the USA and we use 110V or 220V at 60 cycles. Should I use 1200W grid tie power inverter DC 14V-24V to AC 220V with LCD power meter for solar or 1200W grid tie inverter DC 28V-48V to AC 110V with LCD meter for my solar panels? Should I run them in set of two and double the voltage to 57.7? I like to set it up where I can get the most out of the inverters and the panels, your comments will be highly appreciated. 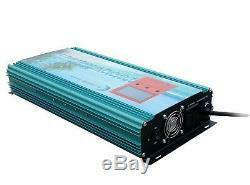 You can use our 1200W grid tie power inverter DC 28V-48V TO AC 220V 60HZ due to below reasons. Your solar panels no load voltage are 35V, and 28V after loading, then the above DC range is just fit it. You can use 5 pcs solar panel and connect them in parallel(DC voltage will be 28V). 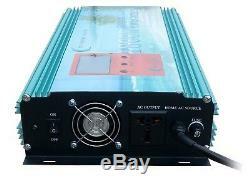 Then connect them with 1 unit 1200W grid tie power inverter. 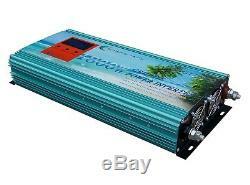 Regarding use AC 220V system inverter, most home main AC power is 220V. In United States, then separate to 110V(sockets on wall), so you can connect the inverter to home main power (220V) directly. It is ok to use AC 110V inverter, just plug into any home AC 110V socket, but might lose 5-10% power. Q: how to connect Power Jack grid tie inverter? A: inverters DC side connect with solar panels, then the inverter's plug just plug into home AC socket, and turn on inverter to start work. It is easy to use and no need to add controller. Q: Can solar panels can be hook in series or in parallel? A: solar panels can be hook in series or in parallel, if solar panels are in same voltage, they can be hook in series or in parallel. But if solar panels not in same voltage, they only can be hook in series, can not hook in parallel. Q: Can your grid tie power inverter can be hook together? A: yes, our grid tie power inverter can be connect in parallel, but must be same version. 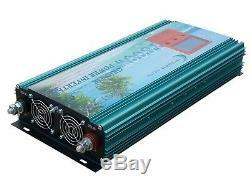 The item "1800W Grid tie power inverter DC 26.4V-45V to AC 110V + LCD meter, MPPT for solar" is in sale since Wednesday, March 5, 2014. This item is in the category "Home & Garden\Home Improvement\Electrical & Solar\Alternative & Solar Energy\Chargers & Inverters". The seller is "6apex_2012" and is located in Dong Guan. This item can be shipped worldwide.